Mark is a visionary leader, bringing more 25 years of experience in establishing operational optimization across diverse organizations. He has been nationally recognized for both strategy development and providing corporate vision. 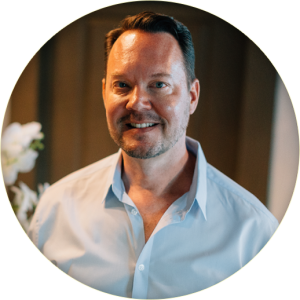 Mark is distinguished for an entrepreneurial mindset with creative problem-solving ability combined with operational effectiveness. He especially enjoys converting strategic plans into tactical reality. His background comes in the form of running multiple businesses. Through the unpredictable journey that life provides, he found his way to the Medical Aesthetic industry. It didn’t take long to determine that he has a real love of everything it has to offer! Educationally, he brings an undergraduate degree in Public Relations and Organizational Communications from Carroll University and a Masters Degree in Psychology and Counseling from Eastern Illinois University. On this most recent journey, he has picked up certifications in spa operations and marketing. 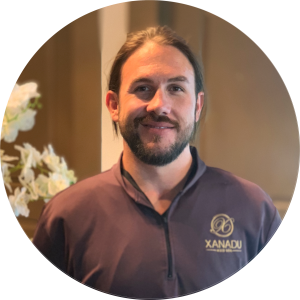 He consistently continues to expand his knowledge of the aesthetic and spa industry through ongoing education and training, always seeking new opportunities to add to his knowledge foundation. He has two teenage daughters who he loves deeply and is bracing for the reality of college for them in the very near future. Briana is a Colorado native who grew up around the Steamboat Springs area. She spent a little over a decade in medical offices as a medical assistant and office manager. Business school drew her into getting her bachelor’s in business administration degree with a concentration on management in 2010. “Bri” has used this degree to run her own photography business, manage her husband’s business, as well as manage three retail stores. Her focus in work has been running businesses efficiently and with a smile. What drives Bri is the satisfaction that she has made the people around her smile and have an enjoyable experience while expanding her knowledge of the medical spa environment. When not at Xanadu Med Spa, Bri has five children and one grandson who keep her busy. She loves spending her time with her expanding family and business of three ferrets. She loves camping, hiking, and photography. Bri collects picture frames and fills her walls at home with fun pictures of beautiful Colorado and family. An integral part of the staff at our med spa, Irene Sokolowski, M.D. is board certified in Obstetrics and Gynecology and has been practicing medicine for almost 20 years. She earned her undergraduate degree from the University of California, Berkeley in biochemistry and then attended Loma Linda University’s School of Medicine where she earned her medical degree and graduated with honors. She completed her residency at the University of Hawaii. Dr. Sokolowski is a member of the Alpha Omega Alpha Society and a Fellow of the American College of Obstetricians and Gynecologists. 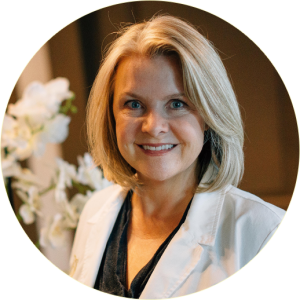 Dr. Sokolowski has continued her medical education with advanced training in Bioidentical Hormone Replacement Therapy, medical weight loss programs, and med spa treatments. She is a happy mom who enjoys every day to its fullest providing support for her family and balancing that with the love she has for her career. toxins (like Botox) and dermal fillers. Traci is NCCPA certified, reliable and committed to giving her best to the patients and to the practice she works for. She has even served as an expert consultant to the Colorado Medical Board. Her deep understanding of the dermal make-up of our clients and broad experience make her an exciting addition to the Xanadu team. 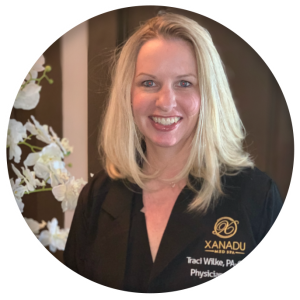 Traci’s experience allows her to deeply understand the outcomes of treatments and helps her work side by side her clients to build the best treatment strategy possible for optimal correction. Melanie Zimmermann received a Bachelor of Science in Human Development from Colorado State University. After working as a Social Case Worker for five years, she then began her nursing education attending Front Range Community College, and soon after received her BSN at the University of Texas. While working as a Registered Nurse, Melanie gained experience working in outpatient surgery centers in perioperative areas, in the emergency room, and infusion nursing. Her interest in the aesthetics field prompted her to attend The National Laser Institute in Dallas, Texas where she received certifications in neurotoxin injectables as well as dermal fillers. 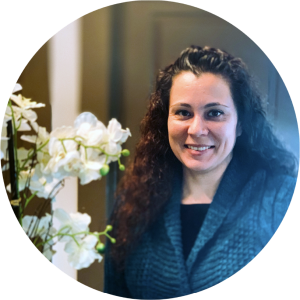 Upon completing graduate school and receiving her Masters in Nursing as a Family Nurse Practitioner, Melanie continued broadening her interest in aesthetics, adding hormone replacement therapies, weight loss treatments, and vitamin infusions to her repertoire. Her knowledge and experience make her a valuable asset to our Fort Collins med spa. Melanie is a Fort Collins native and after living for several years in Houston, Texas, her husband and their many pets moved back home. She is excited to start her career in her hometown and pursue her passion in the beauty and skincare industry while applying her medical background. 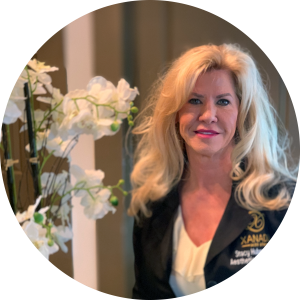 Her attention to detail and conservative, yet effective, approach allows her to tailor treatment plans that fit a patient’s needs and desires, yielding in aesthetically pleasing outcomes. Stacy Huber, RN, BSN comes to Xanadu Med Spa with more than 20 years of nursing experience. Stacy has recently focused on her passion for Aesthetic Nursing. She is a graduate of the National Laser Institute in Scottsdale, Arizona. Stacy is very comfortable with clients and wants to help them feel their very best. She enjoys spending time with her husband Dave, her two dogs, and her grandson Kaden. 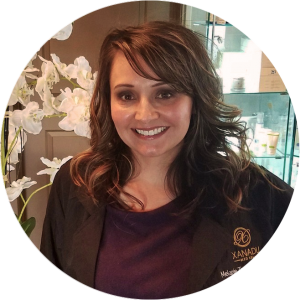 Stacy is very excited to be a team member of the Xanadu med spa family and is eager to further grow in the industry! 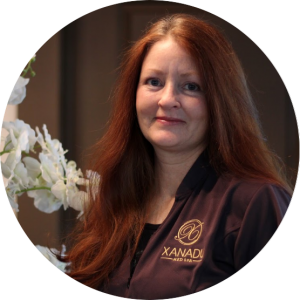 Additionally, Rhonda is certified in Oncology Esthetics delivering specialized oncology treatments with clinically appropriate products for Xanadu’s oncology clients. 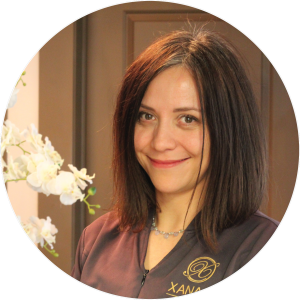 Antonia is a licensed massage therapist and aesthetician who has been working in the med spa industry since 2000. For the last five years, she has worked as a skin educator teaching people about the health benefits and the art of skin care. Antonia specializes in treating a variety of different skin conditions including prematurely aging skin, sun damaged skin, and acneic skin by providing anti-aging, skin-brightening, and purifying treatments. 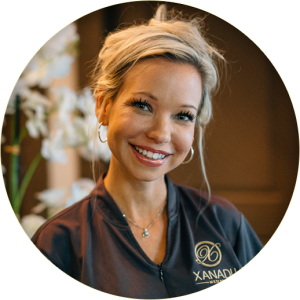 She creates custom treatment protocols for each individual as our needs are unique and continually changing. Additionally, Antonia specializes in brow shape design and provides waxing services. When she is not learning new techniques in the industry, teaching, or working, Antonia enjoys dancing, yoga, gardening, knitting, hiking, rafting, and spending time with her daughters, her husband, and all their wonderful friends in beautiful Colorado. Helen’s passion and unique manual therapy approach provide a gentle, caring, holistic restoration of the inherent self-healing and regulation mechanism of your body. Over time, your body lessens this ability due to the process of aging, illness, trauma, repetitive injury, surgical scarring, postural imbalances, emotion, and mental and spiritual stresses. The goal of each session is to precisely assess and address the root cause instead of the symptoms. The session includes a full assessment, manual manipulation and integration. Modalities such as muscle energy, cranio-sacral, fascial normalization, organic manipulation, and active stretching combine to restore the balance of fluids and tissues. Helen’s 25 years of experience and education in Manual Osteopathy (Canadian College of Osteopathy), Massage Therapy (2200 hour Canadian training), Acupuncture, Personal Fitness Training (NASM), and Reflexology are beneficial for those who have tried “everything” and still have pain or dysfunction that prevents living life to the fullest. As you can no doubt tell from reading the profiles of our experienced staff members above, we care a great deal about the culture of our Fort Collins med spa. Our training is as detailed as it is cutting-edge, which means our clients are able to receive only the highest-quality of innovative day and med spa services. If you are interested in finding a local day spa you can trust to find the right treatment options for you, come see us at Xanadu soon.